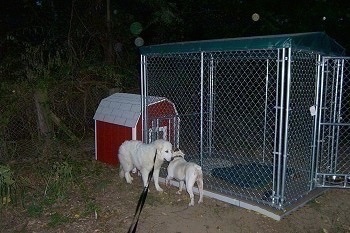 Tundra meets Spike and Allie—After having trouble with fox and raccoons eating our guinea fowl and ducks, we decided it was time to try our shot at a flock guardian dog. 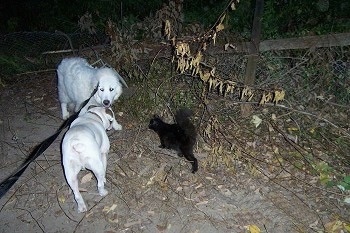 We choose a 7-month-old Great Pyrenees bred by Majesta Great Pyrenees. We named him Tundra. Before we adopted him, we had some concerns about the dog’s age and his ability to acclimate with our animals, but decided to give it a try. 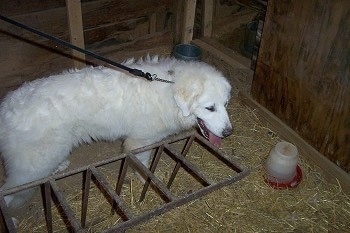 Tundra came from West Virginia, but I met the breeder halfway at a hotel in Virginia. 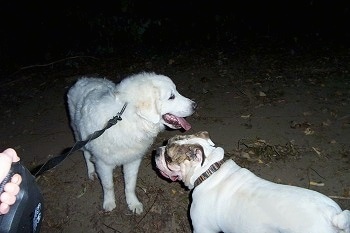 In the city, Tundra was a bit skittish with all of the sights and sounds a city holds, but after the 5-hour drive home, Tundra fit right in on our farm. 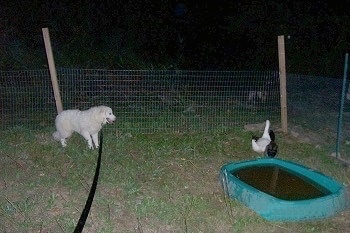 Tundra meets the ducks! He gave them a glance, but was more interested in sniffing the ground than he was in the ducks. He looked at them and then seemed to not give them a second thought. Tundra after a visit in the duck pen—notice the duck feather stuck to his tongue. He thoroughly sniffed out the duck area, but paid no mind to the ducks quacking near him. Also notice Tiger the cat checking him out and the other two pair of cat eyes to the right. 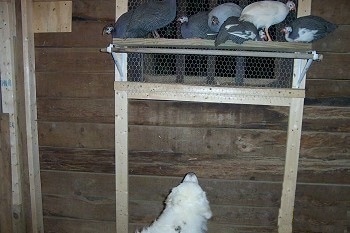 Tundra visits the guinea coop—He gives the guineas only a momentary glance before giving the coop a total sniff over. The guineas are more interested in him than he is in them! Sniffing out the coop! 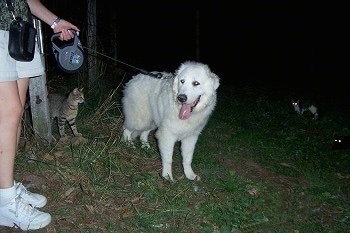 Tundra seems very much at home, nothing like he appeared when I first met him in the city. 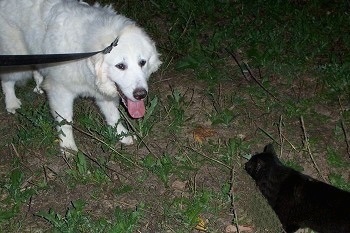 Tundra meets Sammy the cat—Tundra looks at the cat and walks away from it as if he has known it all his life and it just belongs there. 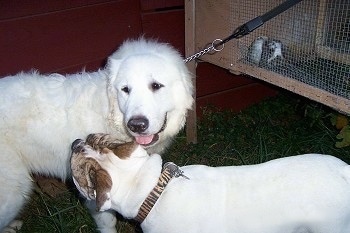 Tundra meets the rabbits—he only gives them a glance. Spike is very interested in his new brother. We have a lot of work to do with Tundra before he can be allowed to fully work the farm, but he shows excellent signs of being a wonderful working farm dog. I will introduce him to the horses sometime soon.